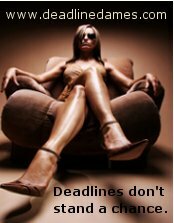 Follow the legs to The Deadline Dames! Today, I posted a short excerpt of my young adult novel currently out on submission with my agent, Miriam Kriss. My critique partner, Rachel Vincent, has a new book coming out soon. Feel free to post this banner anywhere and everywhere!